South Korea is one of the so-called “Asian Dragons” – Asian countries with rapidly growing economies. This new-found wealth is easily seen in the streets of the trendy Gangnam neighborhood, in the exotic cars on the streets, and in the high-end fashions worn by locals. 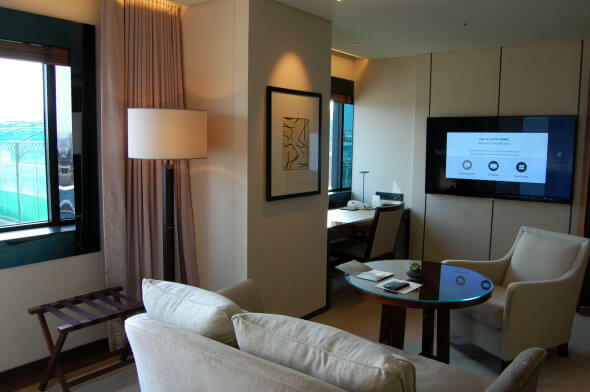 If you want to experience Seoul like the wealthiest Koreans, there’s no better place to splash out than the Shilla Seoul, which was built in 1979 (and recently fully renovated) and sets the standard for luxury hotels in South Korea. The hotel’s 464 rooms come in Standard, Executive, and Suites with marble bathrooms with bidets and rain showers, minibars, 65-inch Smart TVs (with a personalized welcome message upon check-in), free wired and wireless internet, and air conditioning. There’s definitely a wow-factor here. Upon entering, the automatic shades revealed the view of the city and flooded the large room with light. My room was an Executive, with a King bed; a large sitting area with a loveseat and chair; a desk; a flatscreen tv; and a large wardrobe that also contained the most beautifully-designed mini bar I’ve ever seen. The rest of the room earns just as many superlatives. My King bed with goose down bedding was so comfortable it was hard to leave, the robes and slippers were nearly absurdly plush, and the tub was one of the deepest I’ve been in. 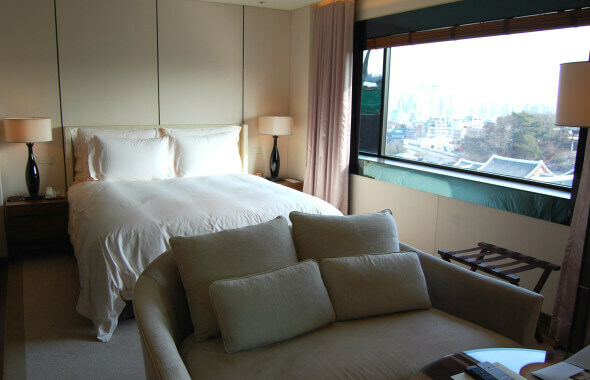 Once we checked in and saw the room, my husband and I scrapped our other plans, opting instead to spend as much time at the Shilla as we could for our one-night stay. It seems like every detail has been thoughtfully considered, every scenario accounted for. Aside from the standard amenities (hair dryer, telephone) you’ll also find high-quality Molton Brown toiletries, toothbrush and shaving sets, a digital scale, and even a hair brush. Rooms are stocked with magazines, and for business travelers and the tech savvy, the technology kit (containing HDM, USB, and LAN cables) is an added bonus. Should you not be able to bear to drink champagne from the wrong glass, you’ll find both champagne glasses and wine glasses in the mini-bar, along with water glasses and tea cups, and a supply of complimentary tea, coffee, and mineral water. If it’s raining, just grab the umbrella from the closet. Pillows not to your liking? Check out the pillow menu and order one in the size, shape, filling, and firmness that you prefer. 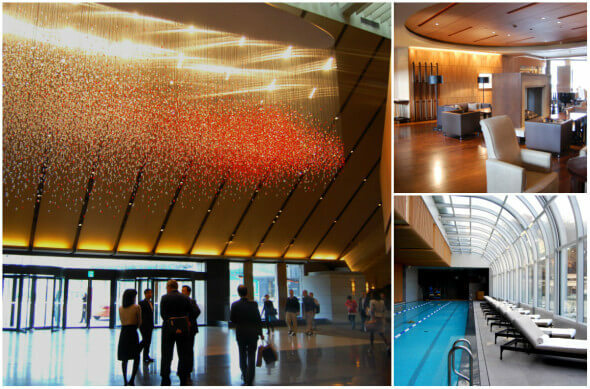 Outside of the rooms, the service and amenities are equally luxurious. Staff speaks perfect English and can help arrange any tours or transportation; if you need a taxi, simply step outside and you’ll find a line of cabs and towncars waiting for you. The hotel is located at the base of Namsan mountain and there is a metro stop nearby, but the hotel’s position high on a hill can make it feel a bit secluded; thankfully taxis are inexpensive in Seoul so it’s easy to get to and from the Shilla without taking public transport. On the ground floor, there’s a lounge and an all-day dining restaurant that serves a lavish buffet with items including sushi, crab legs, foie gras, and a mix of Chinese, Japanese, and French dishes. The hotel also has Chinese, Japanese, and French restaurants, a bakery selling freshly-baked breads and French pastries, and a high-end wine shop. Rooms service is also available. On site, there’s a gym, sauna, Guerlain spa, indoor and outdoor pools, indoor golf range, a jogging track and sculpture garden, meeting facilities, and a basement level of luxury and designer shops. A short walk (or even shorter shuttle ride) through the parking lot will take you to the Shilla’s own Duty-Free shops. 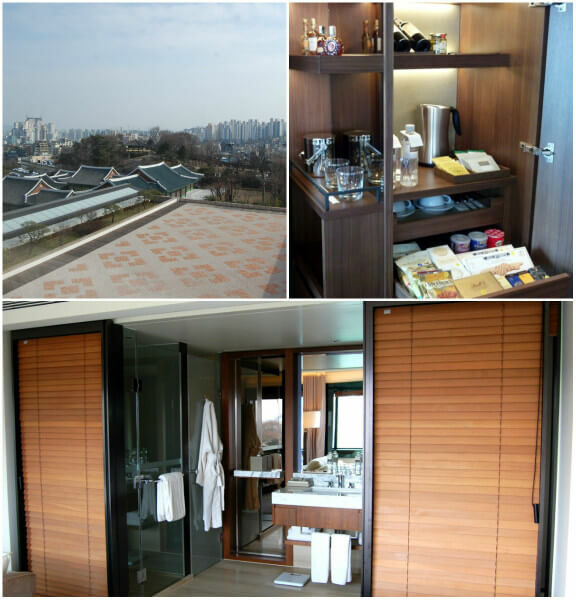 Rooms at the Shilla don’t come cheap – they start at around $300 per night – but you’re paying for much more than an extremely comfortable bed. It’s the luxury amenities, the superlative service, and high-end personal touches that make the Shilla the best place to stay in Seoul. In a crowded city of more than 10 million people, the Shilla is a elegant respite in the middle of it all, a quiet place to relax and recharge in the utmost of comfort. Book directly online at through the Preferred Hotel Group site. You can also make reservations on Expedia, agoda.com and Priceline. I was a guest at the Hotel Shilla but all opinions are my own.